The Allele team believes that in business as in science, life comes from innovation. 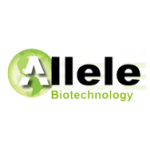 Over the past decade, Allele has become a reliable source for superior fluorescent proteins, highly efficient Luciferase assay substrates, and genotyping kits, all novel products only from Allele. Allele Biotech has been a leader in the RNAi field with its recent patents in Pol III promoter-driven siRNA, shRNA, and miRNA.